USRC Mohawk was a steel steam powered revenue cutter (206 ft x 32 ft) built for the U.S. Revenue Cutter Service by William R. Trigg Company at Richmond, Virginia. 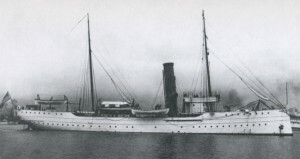 She was commissioned into the United States Revenue Cutter Service on 10 May 1904 at Arundel Cove, Curtis Bay, Maryland. Her primary duties in the Revenue Cutter Service and Coast Guard were assisting vessels in distress and enforcing navigational laws as well as a derelict destroyer. Mohawk was temporarily transferred to the United States Navy on 6 April 1917 for service in World War I retaining her Coast Guard crew. 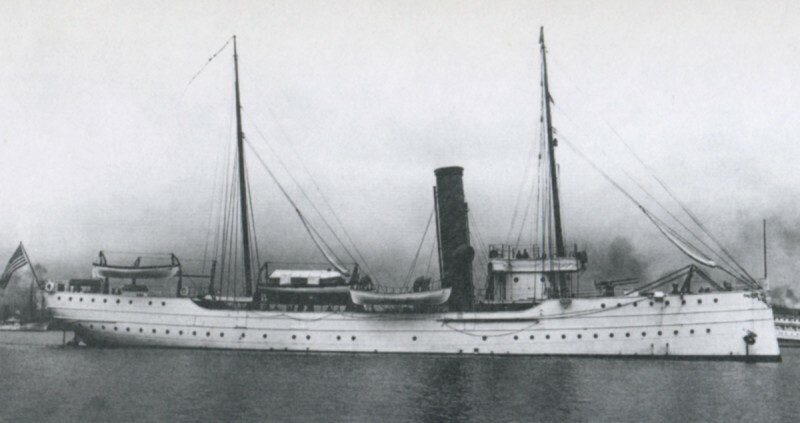 While serving on coastal duty in connection with convoy operations, she was struck in Ambrose Channel by the British tanker SS Vennacher and sank on 1 October 1917 off Sandy Hook, New Jersey. All 77 crew members were rescued by USS Mohican and USS Sabalo. 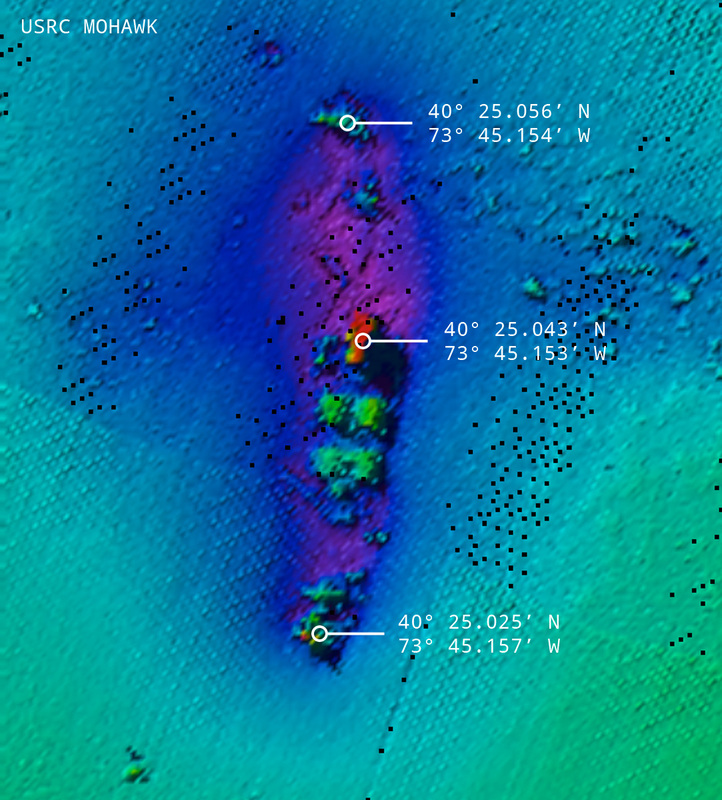 The water was deemed too deep to warrant salvage operations (100 ft) so Mohawk was left where she sank. 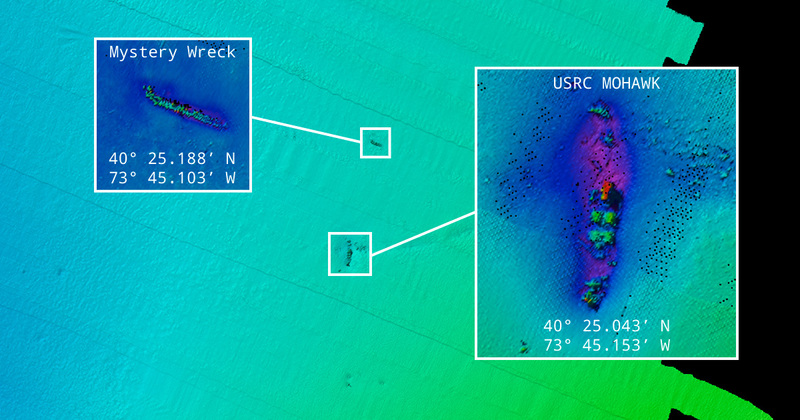 USRC Mohawk was surveyed with multibeam sonar by NOAA Ship Thomas Jefferson in 2009 during survey cruise H12036. 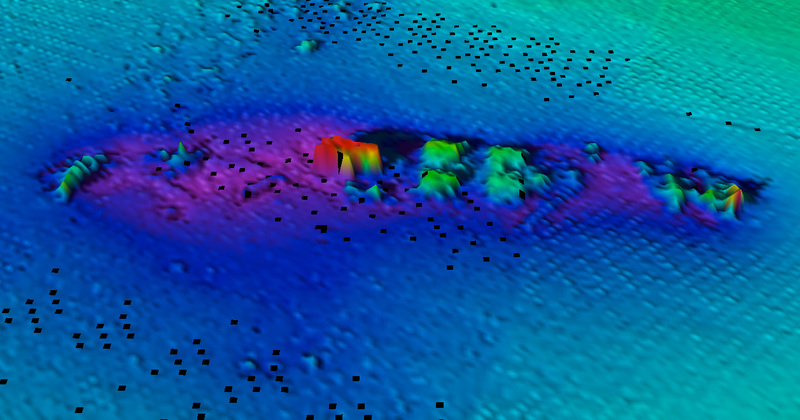 Note the presence of a mystery wreck 250m (820 ft) north of USRC Mohawk. I say mystery wreck simply because I wasn’t able to find a record of it. But I’m sure someone must know of its existence. It may not be a shipwreck at all. It’s very long and narrow measuring 32m x 3m (105 ft x 10 ft) and rests in 29m (95 ft) of water.